Look, it's 1920s Dumbledore! For some reason, some people seem to think it was revelatory news a few days ago when Marvel said Jude Law's character was Yon-Rogg and not (as assumed by the fanboys who love ferreting out every spoiler and morsel of casting news they can possibly find) Mar-Vell. 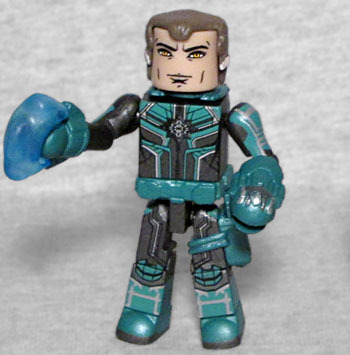 How is it in any way "news" when the Marvel Legends and these Walgreens-exclusive Minimates have been out since last month and have the name "Yon-Rogg" right there on the packaging for everyone to see? Gigolo Joe is wearing his green and silver Starforce uniform, and it's a slightly different pattern from the rest. Everybody's is unique! Which makes them less of a uniform and more of a general fashion choice, doesn't it? He has a holster on his left leg, and a gun for it, and his gloves are new molds with extra bits sticking off the sides. He carries some translucent blue thingamabob which will almost certainly make more sense once we've seen the movie, and for times when you don't want him wearing his helmet, there's a "collapsed" version that lays against his back. 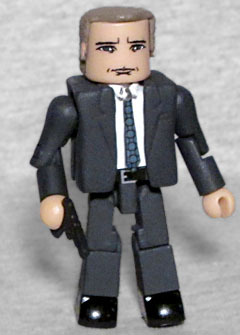 This is the third Phil Coulson Minimate, and it's the best yet. In addition to a superior likeness, this one gives you the option of showing him with his suit jacket on, or with it off. For those times, there are alternate white "shirt sleeve" arms and a shoulder holster. The holster won't hold the included gun - it's just a solid little chunk of plastic molded as part of the harness - but it does make the look complete. His tie is a separate piece, not simply something painted on (which might look okay when the jacket wasn't on, but you really need the 3D to stand out when it is). This entry was posted in Art Asylum, Marvel, MMMR and tagged Captain Marvel, Minimates. Bookmark the permalink. But Kristofer Hivju is Tormund Giantsbane! To be fair, they make fun of Benedict Cumberbatch's name too. Equal opportunity and all that. I'll have you know that Brimpleybick Cucumber is a perfectly normal name!